Home Latest News Oliver! It’s time to buy a ticket or two! Tickets for this summer’s highly anticipated production of Oliver! at Lincoln Cathedral will go on sale on Monday 8 April at 10am. The ever-popular Starring Lincoln Theatre Company will bring this fantastic show to life in the unique and atmospheric surroundings of Lincoln Cathedral from Monday 5 to Friday 16 August 2019. Previous productions by Starring Lincoln Theatre Company at the Cathedral have included Jesus Christ Superstar and Jekyll and Hyde, and all have been praised for the professionalism of the production. “What’s truly satisfying is that the show is produced and performed by the people of Lincoln. The community has come together to create a genuine cultural highlight, and that’s something everybody associated with our wonderful city should be very proud of. “People come from all over the UK to see these shows and are often astounded at what we manage to achieve. I know we’ve gone to another level this time round, I can’t wait for people to see it,” added Ben. The Very Reverend Christine Wilson, Dean of Lincoln said that she is delighted to be welcoming the cast and audience to Lincoln Cathedral. 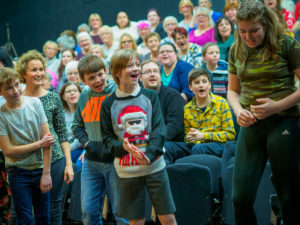 “The production is a wonderful opportunity for the community to come together both to perform and to enjoy the show in a unique setting,” she said. The Dean also added that it is an opportunity for reflection on the sometimes challenging themes of the story, such as child exploitation and domestic violence. “While these may seem distant from our everyday lives, they are very real and current concerns, and this is an opportunity to encourage people to question how we respond to these issues today. “I’m looking forward to the cast bringing to life the iconic characters and can’t wait to hear the wonderful songs fill the Nave,” she concluded. Tickets will be available from 10am on Monday 8 April and can purchased online at www.lincolncathedral.com, in the Cathedral shop or by calling Lincoln Cathedral on 01522 561658.